If you thought the name Yung Jake sounded familiar, then you’ll probably remember his data-moshing vid trashing the cool & nerdy glitchy trend that made one feel like their internet was broken while watching clips. That’s right, he was the one making a data-mosh promo to ridicule data-moshing! E.m-bed.de/d is not that different in the sense that, as you would probably expect, it deals with the processes a music video can go through in the age of social media: viewing, blogging, tweeting and of course embedding. 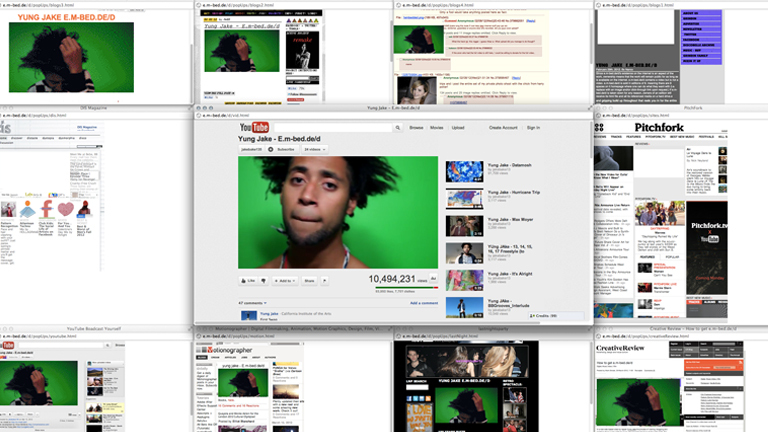 Yung Jake simulates a Youtube interface showing an exponential growth in the views recorded by his vid. The more views, the more browser windows open and we can see the promo’s being picked up by different blogs and music video platforms, while also being tweeted by celebrities such as Justin Bieber. And of course, in a cyclical way, the more media attention, the quicker the viewer’s number grows on Youtube. The funny part? The video is also referencing actual blog posts referencing the video referencing the blog posts referencing the video… Such as this one! Don’t get lost in this referencing chain however, or you might be missing the bigger picture about promos and social media working together. But do feel free to become part of the process by tweeting, Facebook-ing or blogging Yung Jake’s E.m-bed.de/d!